National Bobblehead Day is celebrated annually on January 7. This day recognizes a day of celebration for all spring-connected head bobbing figurines. Bobbleheads have been around for over 100 years and are found in different shapes and sizes. However, none are more popular than those that depict athletes, professional sports teams, mascots, cartoon characters, and celebrities..
On November 18, 2014, the National Bobblehead Hall of Fame and Museum was announced. The museum will open in 2016 in Milwaukee, Wisconsin, and will house the world's largest collection of bobbleheads, a hall of fame section for the best bobbleheads, as well as many exhibits related to the history and making of bobbleheads, and much more. For addition information on the National Bobblehead Hall of Fame and Museum visit www.bobbleheadhall.com. 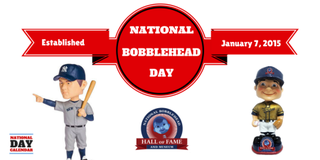 The National Bobblehead Hall of Fame and Museum in December 2014 in accordance to the policies set forth to designate a National Observation Day. A Japanese dish, made up of typically either seafood or vegetables that are battered and deep fried and enjoyed by millions of people across the nation, has its own special day each year on January 7th when we celebrate National Tempura Day. Since the Genroku era (September 1688 – March 1704) tempura was originally a very popular food that was eaten at street vendors called 'yatai'. Within our research, we were unable to find the creator of National Tempura Day, an "unofficial" national holiday.